It’s spring cleaning in autumn! Have you been pottering around your home lately cleaning and organizing like I have? It’s definitely something I do much more of around here before the holidays, and then again in early spring when the earth starts thawing and the crocuses start peeking out. Summer and winter, as I’ve found, are not idea for deep cleaning and organizing. Spring and autumn on the other hand, are better suited for taking the time to freshen up your living spaces to make them a more mindful reflection of what you value and hold dear because they are transition seasons. 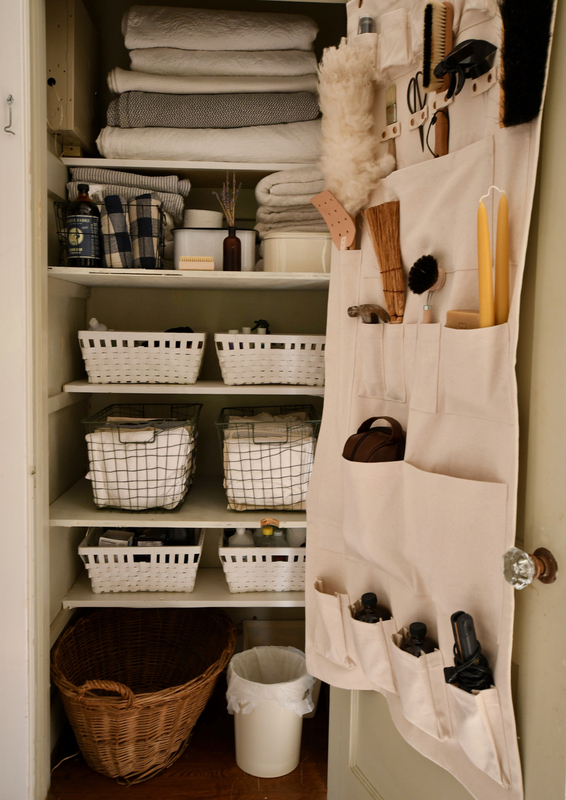 If you’ve had the itch to tidy up your home this season, I think a messy linen closet is a great place to start. Vacations sans kids and yoga practiced alone aside, nothing gives me greater inner peace than decluttering and organizing a disheveled and messy closet. It’s like a physical manifestation of my mental clutter sorting itself out with each and every fold. A zen home, a zen mind. Some people find this mantra overwhelming, untrue, or simply unnecessary, whereas it happens to rings true and vital for someone like me, who has learned over time the importance of making mindful everyday living at home a priority because it offers an abundance of inner peace while lessening my sometimes crippling anxiety. Bringing order to our lives through simplicity and beauty in how we choose keep our home is one way to infuse calming energy into the space we live most intimately. Thomas Merton reflects how wonderfully divine the ordinary bits of life can be, and how alive and grateful we can become, if we choose to see life through the lens where the mundane radiates meaning, connection, and beauty, instead of drudgery we take for granted. For me, keeping our home not only running well for our family’s needs but also flowing well with regard to our family’s overall wellbeing, means revering the ordinary as valuable and important. It means practicing thankfulness and folding that grateful energy into the work done here, so that where we live is a place rooted in care and appreciation for the little things in life, while teaching the five of us abundant lessons on ow to “kneel and kiss the ground wherever we may stand,” as the mystic Rumi once shared. And so, organizing and putting things in their rightful place has always brought me a great deal of peace, especially when it’s a part of our home that’s hidden away, like junk drawers or closets. Not everyone is this way, in fact, Stella just “cleaned her room” by shoving everything under her bed. So. But some of us are! And some of us don’t even realize how much clutter affects our day to day doings. Maybe you too shove things in hidden places but feel weighed down by knowing chaos is brimming. I somehow discovered this about myself a long time ago, and now I know that doing my best to keep the inside spaces of our home tidy will affect my inner wellbeing too. I was the kid prided her shy self on her color-coded closet growing up, along with the tidy contents of her elementary school desk and her orderly middle school locker. This is probably a strange personality quirk, but frankly, I’ve always received satisfaction from such tidy pursuits. Because when the insides are just as neat and tidy and pretty to look at as the outsides, I believe you can feel it. The inner environments we are a part of affect the way we perceive the outer environment, and this goes for our emotional landscape too! It’s easy to toss things into these often overlooked spaced and and think to oneself, “One day I’ll get to it…or…it doesn’t matter because it’s behind this door, wall, or cupboard etc.” but the problem lies in the negative energy there in the clutter, excess, and mess that can compound and add stress to your wellbeing and your environment over time. In keeping with the ethos of June Home Supply and how I do things here on Homesong, I’ve come up with 10 simple tips to help you bring order and beauty to your linen and catch-all closet at home. These steps are tangible ways you can spruce up the interior today, so you can feel the serenity at home from the inside out, tomorrow. Simplify | Less is more. Repeat: less. is. more. Give yourself the challenge of going through one closet today and paring down to the bare essentials. You do not need seven sets of sheets for one bed. Two-three per bed will do. Get rid of all expired medicine and things you haven’t used in a year. Do you really use those toiletries? Give away extra blankets to shelters. Donate what you can, recycle what you’re able, and toss the rest. Keep your closet space as simple as possible, because this will help you greatly in keeping it orderly as the year goes on. Stuff = clutter. So, less stuff = less clutter. 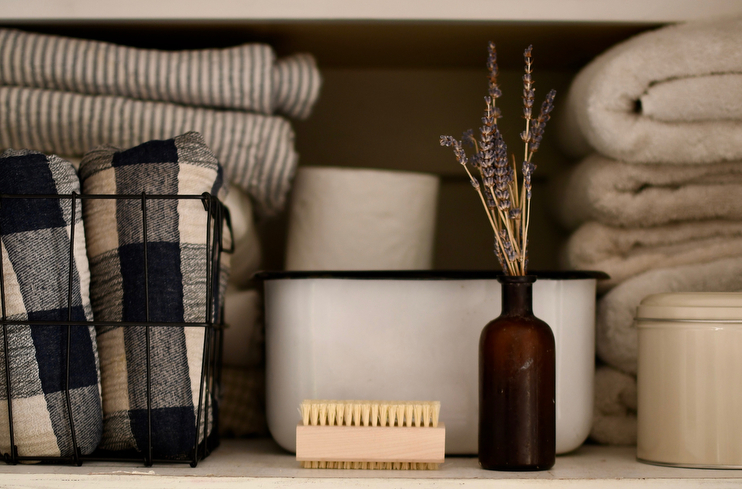 Fold This Way | Folding linens and towels in a tidy fashion will help make your closest roomier, more orderly, easier to navigate, and aesthetically pleasing. Follow this folding method if you find you’re in need of a different method to store your linens. You will find it makes locating a certain item quicker to find, therefore, saving you time and energy. Add Lavender | Have you ever thought about putting a little bouquet of lavender inside your closet? This is very Enneagram Four of me, but I cannot help myself. I enjoy adding floral freshness wherever I can in our home, and it only makes sense to add a bit of Southern France where our linens live, making this tiny space smell like lavender fields. You can find dried lavender all over these days, as well as old apothecary vases for them to live in. A bonus of considering viewing the insides of your home just as important as the outsides, is that you’ll find you will end up taking better care of those spaces as well. So adding lavender becomes more than adding lavender, you see? Utilize the Door | This tip is a must for those who have little to no storage in their home. This old colonial of ours has one catch-all closet on the second floor, which you see above. Each room in our home has one small closet for clothing, well two in the master bedroom thank heavens, but we do not have a closet at all on the main floor at all. Where did folks keep things that needed keeping downstairs back then? Because all of our odds and ends need a place to live, these things are kept inside our linen closet, mainly on the door. This sturdy, beautiful, and well-made canvas door organizer helps keep all our small tools and the like orderly and easy to find. I love how the pocket sizes vary and you can see what’s hanging. This would also make for a lovely arts and crafts organizer for small spaces. Buy Beautiful and Sustainable Utility | From horse hair brooms to leather fly swatters to extra beeswax candles to dust pans: beautiful and sustainable utility makes a difference. When you choose to buy something that was hand-crafted with care made with quality, sustainable materials, you are making a conscious choice to live with intention and care for the earth. Considering the notion that cleaning tools don’t have to be made from toxic chemicals and plastic that will never decompose into the soil, is one way you can do your part to helping clean up the environment and heal our shared earth home. *I do not recommend going through all your belongings after reading this and tossing out all the items that don’t fit the “beautiful, simple, and sustainable” criteria, but I do recommend given June Home Supply utility section a look over and adding goods from their mindful shop to your home as needed. One of the missteps I’ve seen here and there in the very important zero-waste movement, is to get rid of everything and buy all new eco-conscious products at once. Talk about overwhelming! This is not only crazy expensive for the consumer, but it creates much more waste in return. I invite you to use what you have and use it well, and then consider beauty and sustainability when moving forward with your purchases, both inside your home and out. Add Shelves | We were lucky when we moved in that this little upstairs closet of ours came with lots of shelving inside. Shelves offer more closet real estate, and therefore, more room to keep things in order. They don’t have to come all the way out either! As you can see, several of our shelves are not as deep as our closet, making use of space in a different but functional way. Play around with the space you have, and add shelving when possible to expand your storage options. Keep It Light & Neutral | One little tip I have for making smaller spaces appear larger is to keep them white and neutral. This opens up the space visually and makes it look cleaner as well. If your closet is painted a dark color, consider giving it a fresh coat of cream or white. This will freshen everything up and create a calming closet. Use the Walls | Just as the door is a prime location for additional storage, so are the walls! Use hooks or nails to hang various things that you use often, like dust pans and items with string handles. It’s easy to overlook this part of your closet, but it’s a great and efficient way to get more out of this small space. Lock It Up | This tip is for those who have little ones in the home. Because we have dangerous things like medicine and tools in our linen closet due to a lack of storage space, it’s important to keep it locked up with not in use. Stella and Theodore were not very mischievous as I recall, but Alfie has made up for that twofold. Make a trip to your local hardware store and get the old-school lock with a latch and key hole. Now if your linen closet is only home to linens, this tip isn’t necessary, but I am always surprised how many homes keep things little ones shouldn’t have within reach of little ones! It gives me peace of mind knowing the kids cannot rummage around in here and get hurt. As always, if you enjoyed this read or have something to contribute, I’d love to hear from you. 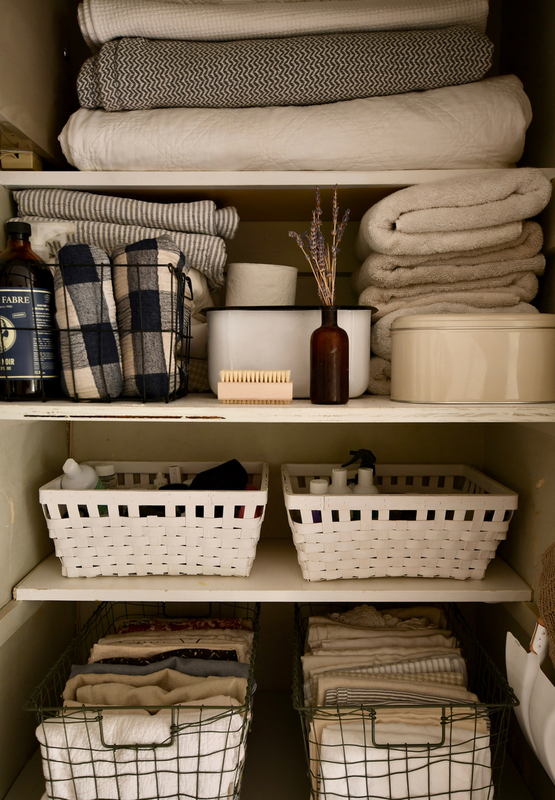 What are some tidy tips you can add when organizing and beautifying closet spaces? And what questions do you have about organizing closets and those hidden areas around your home? And a special thank you to June Home Supply for partnering with Homesong this season. This post was sponsored by June Home Supply and all opinions, words, and photos are my own. I thank you dear reader for supporting the brands that help support this space. Because of my partnerships, I am able to make, write, and share with you!